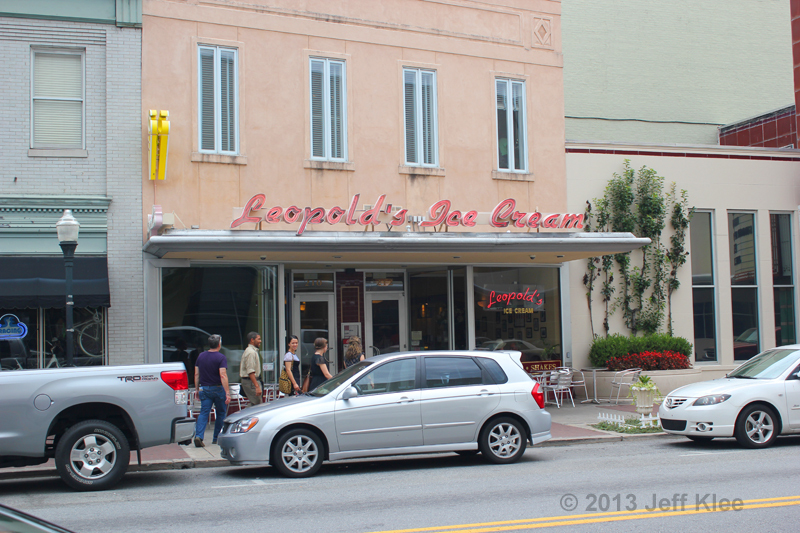 After a lunch at Zunzi’s, we decided to grab a treat at Leopold’s Ice Cream. This #2 rated spot on TripAdvisor (yes, it’s two spots higher than Zunzi’s) is another place that has lines that are many times out the door. I didn’t get a lot of photos inside, so next trip will be a more detailed review. 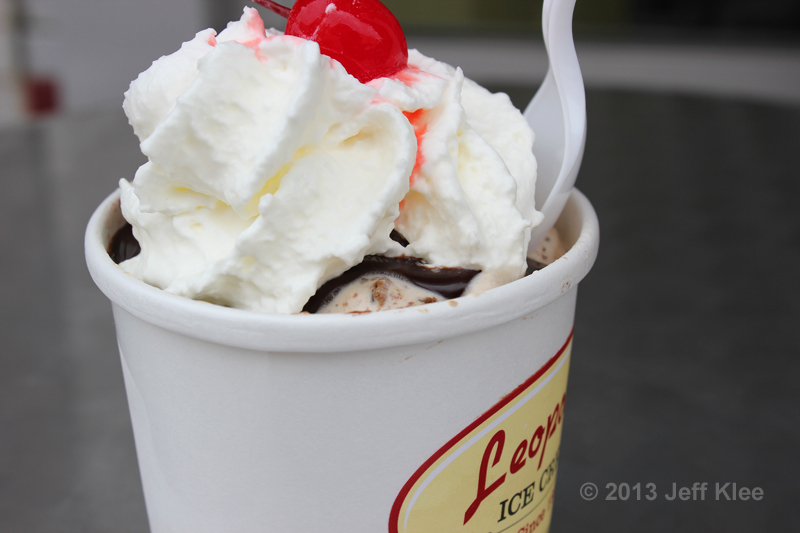 Leopold’s has 24 regular flavors of ice cream and 22 additional seasonal flavors available at various times throughout the year. I grabbed a Hot Fudge Sundae for $6.25. It was not very big. It comes in their large size cup, which I would guess is between one and one and a half cups. I’ll give them credit that they do pack a reasonable amount of ice cream in the cup, but I still like to get a bit more in a sundae. It comes with two scoops, and I chose Dutch Utopia and Thin Mints® & Cream. 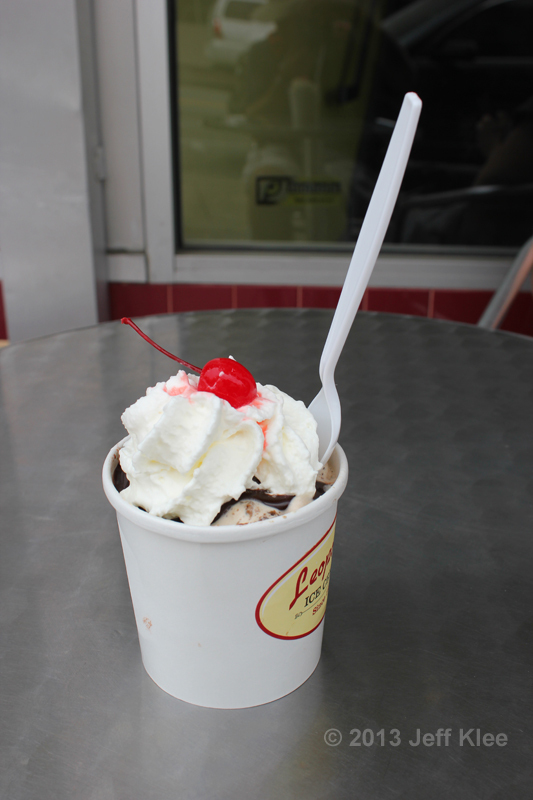 They top the ice cream with hot fudge (real hot fudge, not the fake bottled stuff), whipped cream and a cherry. I’m the last person that should be reviewing ice cream. My wife gets annoyed that I like all ice cream, and most of the time I can’t tell the difference between one and the other. One thing that was quite obvious to me was the mass of flavor it had. The Thin Mints® & Cream had chunks of the cookie mixed in, and the entire scoop tasted strongly of mint. The Dutch Utopia was the same. Strong taste, plus chunks of Dutch chocolate mixed throughout. After I finished my sundae, we went back in so my wife could get a double scoop ($4.75) of Chocolate Raspberry Swirl and Peanut Butter Chippy and I ordered a single scoop ($3.75) of Coconut. Once again, there was an intense flavor of chocolate and raspberry in the one, and real peanut halves in the other. My Coconut had so much actual coconut mixed in, I was actually having to chew my ice cream. So honestly, I don’t know if the ice cream itself was good quality, but I can tell you they were all bursting in flavor, and included the actual solid ingredients that own those flavors. I still think the pricing is a bit high, even for an ice cream shop. $3.75 – $4.75 can get you a pint of many ice creams in grocery stores, however I don’t know where else you can purchase ice cream with so much actual flavor and representing solid ingredients mixed in. I will most likely be back for more on our next visit to Savannah.